I’ve had a hard time finding good urban fantasy lately, and I think it’s because the female characters are so strong and independent that they are completely incapable of asking for or accepting help from others. It’s one thing to be strong, but it’s another thing entirely to be so stubborn that you end up shooting yourself in the foot by thinking that any offer of help means that people think you’re not capable of doing whatever it is you need to do. Thankfully, A Brush of Darkness helped to pull me out of my urban fantasy rut. Abby Sinclair is a strong character, but, though certainly not without attitude, she is also intelligent enough to recognize that she can’t do everything on her own. Her character is a lovely change of pace from typical urban fantasy heroines, and I can't wait to read more about her in book two. Another great aspect of this book is that there is not a love triangle. When they're well-done, it works, but at this point they're so over-played that it was refreshing to watch two people fall in love without the added complication of a second love interest. Abby and Brystion have enough on their plate that throwing in a love triangle really would have been over the top. Though their relationship is certainly not perfect, these two characters fit each other well, and I hope that their relationship only blossoms over the course of the series. The secondary characters in A Brush of Darkness are fantastic. I would have liked them to be a bit more well-developed, but they did not play as big of a role in this book as I expect they will in book two. I loved Brandon, Robert, Melanie, Charlie, and the others, but Phineas, the miniature unicorn, was probably my favorite of all of them. I don't want to give anything away, but he is definitely one cheeky little bugger! The whole concept of TouchStones is not thoroughly explained, which is my only real complaint. This is probably because Abby does not know much about her part in OtherWorld society rather than an intentional omission on the author's part. The ending leaves room for a more in-depth exploration of OtherWorld society in the next book, and I sincerely hope this happens. 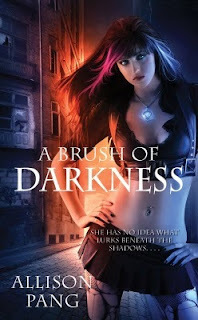 A Brush of Darkness is a fantastic, highly-charged urban fantasy debut novel. Allison Pang has earned herself a place on my highly selective auto-buy author list. This is Pang's debut novel.